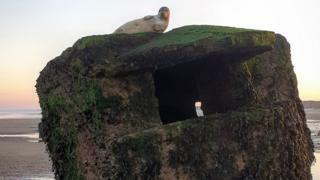 An injured grey seal has been rescued after getting stuck on top of a World War Two pillbox on a beach. The seal was stranded at Fraisthorpe beach in East Yorkshire and was rescued by the RSPCA on Tuesday. It is thought it had been stuck for about 24 hours and was reported by a passer-by, the animal charity said. Despite sustaining an eye injury and being dehydrated, it was otherwise well and was returned to the wild following veterinary treatment. The lofty ledge the seal got stuck on was about 10ft (3m) above the North Sea beach. A spokesperson for the RSPCA said it was thought the tide may have played a factor in the animal's predicament. Leanne Honess-Heather, one of two RSPCA officers that came to the seal's aid, said: "The poor seal was clearly distressed and we could see he had injured his eye. "Because he had been stuck up there for 24 hours, and had been exposed to the strong sun throughout the heat of the day, he was very dehydrated. "The light was fading fast and we didn't have much time. We knew we had to get him down quickly." The seal was manoeuvred into a net by the two RSPCA staff and lowered to the sand. It was taken to Scarborough Sea Life Centre for treatment and released back into the wild on Wednesday. Grey seals are the largest of the UK's two species of seals, the other is the common seal and is a protected species. Pillboxes were small, fortified structures, often placed on or near beaches to deter an invasion by enemy forces from the sea.